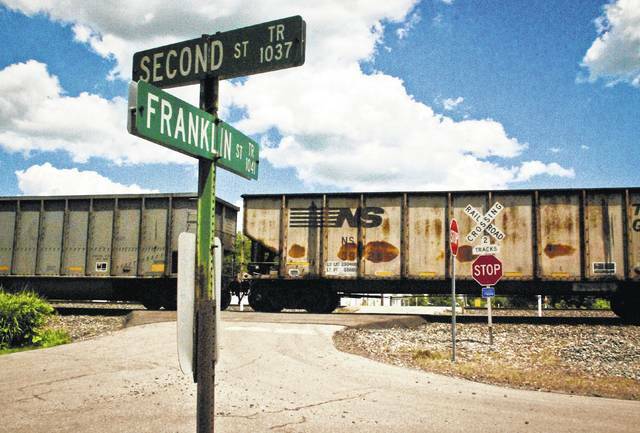 Orange Township’s Franklin Street railroad crossing may be closed if the Ohio Rail Development Commission gets its way. As an incentive for the township to agree to the proposal, the ORDC is offering up to $237,000 in services and equipment for signal upgrades of other township rail crossings. Julie Kaercher, ORDC public information officer, said in 2012 ORDC conducted a study of rail crossings searching for potential closures, but the proposal to close the Franklin Street crossing was then put on the back burner in 2013. Kaercher said residents on both sides of the tracks have “easy access” to Lewis Center Road. “We decided that it is a redundant crossing,” she said. If trustees agree to close the crossing, Kaercher said, the ORDC would help establish a right-of-way for a multi-use trail to cross the tracks on Lewis Center Road one block north of Franklin Street. However, Kaercher said if it was decided that the crossing would remain open, the township would lose the offer completely, including any help with East Orange Road’s trail crossing at the tracks, a project that the township has been working on for sometime. Kaercher said closing the crossing would not impact the quality of life of any of the residents in the small neighborhood around the tracks. She suggested temporarily closing the crossing for three months as a trial run. The Franklin Street crossing only has a warning sign on each side of the road with no automated crossing signals or gates. According to Kaercher, many of the vehicles that pass over the crossing use it as a shortcut to beat the trains across the road before getting to the tracks. Kaercher said the cost to upgrade the crossing with two automated gates and signals could cost the township up to $250,000. Kaercher said the procedure to close the crossing consists of holding at least three community meetings. She said that Monday night was considered to be the first of the three. Lee Bodnar, administrator, asked Kaercher to explain what purpose closing the crossing would serve. “A closed crossing is a safe crossing,” Kaercher said. Kaercher said the closing of the Franklin Street crossing and the help with the trails could be completed by the end of 2018. She said once ORDC makes the initial investment and completes the work, the cost of maintenance falls to the township. Trustees did not take any action on the matter following the discussion with Kaercher. Jokingly, Trustee Debbie Taranto asked if the township closes the crossing that they wait until all the other closed roads in the township are reopened. This entry was tagged delaware county, Orange Township, railroad crossings. Bookmark the permalink.